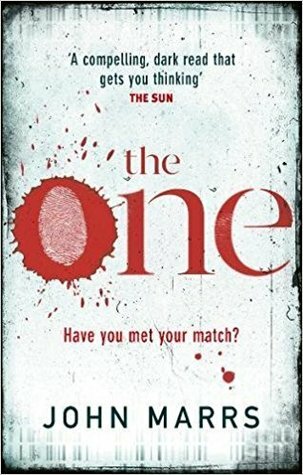 Release Day Review of The One by John Marrs and a US Giveaway! Holy. Crap…. Words cannot begin to describe The One by John Marrs. This is Science Fiction that could possibly one day become science fact. (But, isn’t that what all Science Fiction is? : Fiction until the time comes where it is reality?????) John Marrs, where did you come up with this idea? You are brilliant and I loved this novel! This book has been released in the United Kingdom for some time and it is FINALLY released here in the States! It seems like I have been anticipating this novel forever; So much so I began to worry that it would fail my high expectations, but Marrs exceeded them. The One had been previously titled as A Thousand Small Explosions and there are references to the former title in the novel. I prefer the title of The One to the previous title. The One makes you think and will cause debate… Could this become a reality and would you take the test? What could be the results of taking the test? We experience the stories of five extremely different individuals who take the test and the positive and negative consequences they all face. These stories all have very different results in their relationships as the test only takes into account DNA, and not race, religion, gender, or even location in the world. This is a very compelling and addictive novel and you just want to keep turning those pages! Marrs is brilliant with his short chapters that have you in disbelief as you reach each conclusion. The stories go back and forth between each of the five persons and you don’t know what is going to happen next. (Or you think you know and you are wrong!) I found myself saying, “I must keep reading!” The short chapters make The One a quick and compulsive read. The question still remains: Would YOU take the test????? ***Many thanks to the publisher for granting me an e-arc via NetGalley and also John Marrs as I won a signed copy via GoodReads. I really enjoyed this novel and will treasure my signed copy. Please note that I also purchased a copy via Book Depository that I will be giving away to one lucky US resident! Here is my signed copy! It’s time for a giveaway! This one will be for US only and will run until Saturday 2/24 at midnight Eastern. You are entering to win a new UK edition of The One. I bought it from Book Depository before you could get it in the US. Once I won my signed copy from Goodreads I knew I would give this one away. Good luck everyone!